So, in order to learn how to create a F7 plugin I did this little thing. This is gonna be a no-brainer, trust me. As first parameter you set the message which gets displayed at the bottom. As 2nd parameter you have to set the icon. You can use free HTML here so set what ever you want (ASCii, Font-Icon, Images, SVG…). Third is reserved for options. Can we add emoji in toast message? Hello, I’m trying to use the Toast plugin. But for some reason on Framework7 it says that the Myapp.toast is not a function? I’m not too sure where i’ve gone wrong, since i’ve added the css and js files as you said..
Is there a way maybe i could show you my code? Hi, yes you can upload to Codepen and then post the link to an issue in the Github Repo. ِHi Timo, does this plugin support style for using in android app like material design. There is no mention of android platform. @Arash Hi, I haven’t tested on Android but I think it should work. 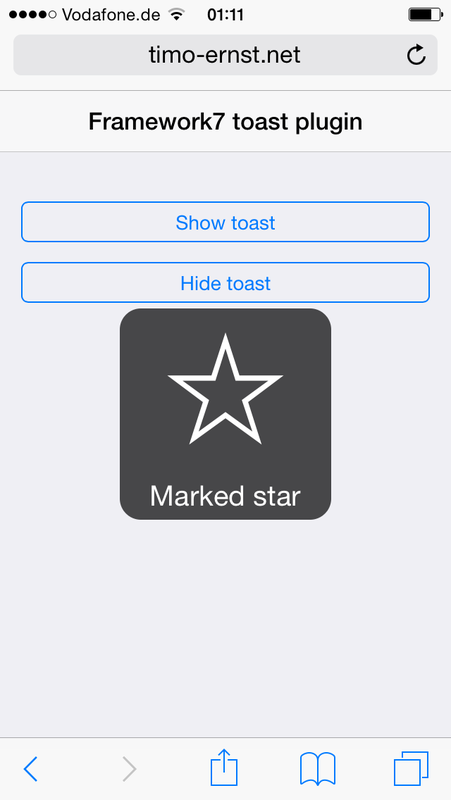 However, the look of the toast element is the same as on iOS.